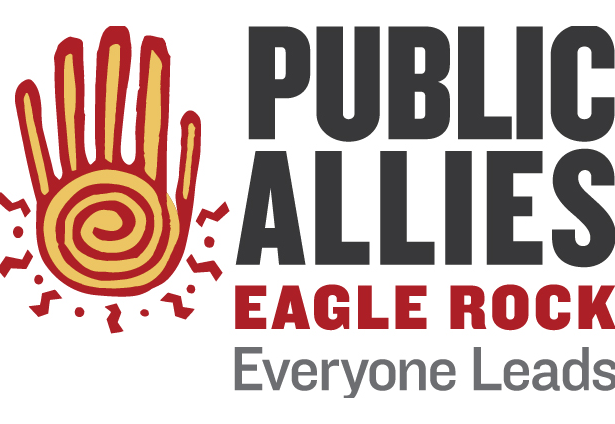 In just five short months, Eagle Rock’s 2015-2016 Public Allies Fellows have made significant impacts on our community, and have helped better serve our students, as well as our national mission that supports re-engaging high school youth in their own education. A few of their initiatives include the development of new courses, including Other Worlds, Street Art as Social Action, Alternative Energy, Call of Duty, The Shape of Space, and Holocaust & Indigenous Genocide. In addition, these dozen 2015/2016 Public Allies fellows were instrumental in creating new student programs, such as our Writing Center, Workout Warriors, Youth Radio, along with affinity groups and support mechanisms that foster a healthier culture around sexual health and relationships. Michael Grant, our Music Fellow, established regular Instructional Fellow meetings on his own initiative to discuss and reflect on experiences in the classroom. Our Residential Life fellow, Aranda Salazar, is defining her newly created position by creating a more structured and engaging curriculum for out-of-class time. When not on wilderness trips, Monse Alvarez, our Outdoor Education Fellow, has been translating our outdoor education materials into Spanish, and is eager to help support literacy across the Eagle Rock curriculum within her department. With the help of Claire Oliphant, our Visual Arts fellow, Mia Stroutsos has taken lead on a new project in Santa Fe, N.M., as our Professional Development Center fellow. In that capacity, she is partnering students from an underserved community with a video storytelling nonprofit called Little Globe in order to tell their stories. These are just a sampling of the projects and initiatives our Public Allies fellows are engaged in. All 12 of them are making their mark on Eagle Rock. These are huge accomplishments that, without question, will continue to benefit the Eagle Rock community long after our fellows have graduated. And now, with nearly half of the fellowship year completed, we’re eagerly looking ahead to Sept. 3 when we welcome our 2016-17 class of Fellows. 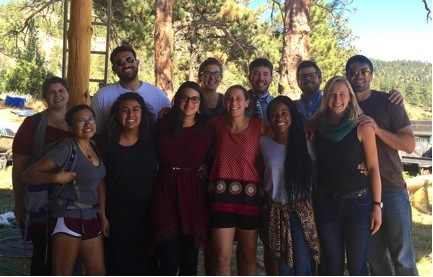 If you’re not familiar with the Public Allies Fellowship program at Eagle Rock, here’s a quick synopsis: Falling under the auspices of our Professional Development Center (PDC), the program offers young leaders the opportunity to serve here at our nationally recognized and award-winning residential high school in Estes Park, Colo. Through our unique service and training opportunity – which ultimately focuses on reengaging youth in their own education – our Public Allies Fellows gain skills that make them highly effective teachers, leadership trainers and youth workers. If you stumbled upon our blog because of your interest in applying for one the fellowships available at Eagle Rock, you doubtless know that Eagle Rock is a leader in the nationwide effort to reengage youth in their own education. We engage with students to understand what is and what isn’t working for them in their own education. And by facilitating the efforts of others interested in the same goal, we contribute to making a meaningful difference in communities and education. Our innovative curriculum draws extensively from a mountain setting that only enhances our emphasis on the environment, outdoor education, active learning, community service, as well as traditional academic subjects, Meanwhile, the PDC provides teachers and leaders in educational with opportunities to develop innovative curricula and teaching methods that can be used to better serve the needs of underserved students in their own communities. The Eagle Rock Public Allies Fellowship program builds on our capacity to successfully accomplish all of the above. Each year, we aggressively recruit a diverse group of creative and enthusiastic college graduates (or those who have life experience equivalent to a college degree) who can share their backgrounds, passions and experiences here at Eagle Rock. Applicants need to have an interest in – and experience working with – young people. As a result, we’re looking for people who bring enthusiasm for learning and a desire to participate as an engaged member of our unique residential community. We want fellows who are willing to make a serious commitment to our program, which lasts a year starting in September. After completing their year of service and development, many fellows go on to inspire change in education as public school teachers, youth development workers, nonprofit leaders or activists for social justice. 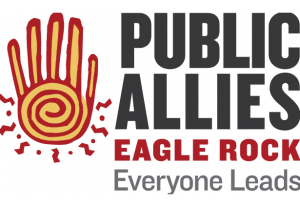 If an Eagle Rock Public Allies Fellowship sounds like something you’d like to learn more about, please visit the application information page online today. Finally, if you’re not entirely sold yet on the opportunity, and you want to know what it’s really like to serve as an Eagle Rock Public Allies Fellow, be sure to check out an article by Kimberly Maul over at Idealist: Public Allies, Idealist, and how changemakers are tackling education in Colorado. 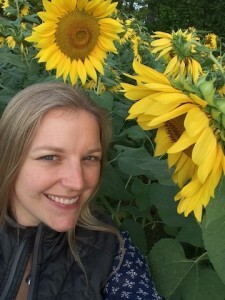 About The Author: Christi Kelston is the Director of Public Allies at Eagle Rock School and Professional Development Center in Estes Park, Colo., where she supports and oversees a dozen teaching fellows through their year of service, leadership and personal development at Eagle Rock. Kelston, who serves on Eagle Rock’s Professional Development Center (PDC) team, has spent the last 16 years working with nonprofits that challenge traditional concepts of education and youth development. Prior to rejoining the team at Eagle Rock (she was a Public Allies instructional fellow in 2008-9), Kelston was the program director of quality improvement at Family League of Baltimore, where she oversaw the quality, implementation, evaluation and tracking of professional development and technical assistance for community schools in Baltimore, Md. This entry was posted in Public Allies and tagged Ally Bolger, Christi Kelston, Claire Oliphant, Kimberly Maul, Littleglobe, Mia Stroutsos, Michael Grant, Monserrat Alvarez, Public Allies Fellow.